Wazzzup! My fellow guitar freaks. Darrin Goodman here with some more guitar ideas for you to help you on your guitar journey; today lets look at some guitar practice scales. As you may already know, there are many different types of scales you can play on your guitar. If you have already been getting into playing scales you probably have already learned the Pentatonic scale and if you haven’t, look through the blog and you will find many mini lessons on that scale. So for this lesson I want to look at the major scale and its degrees and modes. The major scale or Ionian Mode, is made up of the seven notes of a given key. Lets look at the key of A Major for this, which consists of the notes; A, B, C#, D, E, F# and G#. Now by taking the same seven notes but starting on the second note, B, and playing the same seven notes you get the second degree scale or Dorian Mode. If you continued with this process you would have all seven degrees of the scale and all seven modal patters; Ionian, Dorian, Phrygian, Lydian, Mixolydian, Aeolian (natural minor) and Locrian. If you notice that each string has three notes and by making note two and three one and two and adding the next note in the scale you get the next positon. So following the sequence we just did Phrygian would start on the 9th fret of the 6th string. When you learn the patterns you should practice them both ascending and descending, but you should also really practice overlaying them. Being able to connect the patterns together will help you to navigate the neck in any key. Here is a video lesson I did on connecting these two patterns. 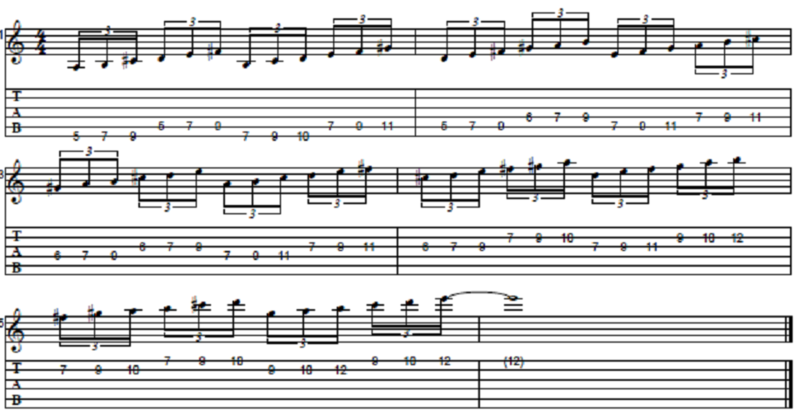 Here are the tabs for that lesson. As you learn the rest of the patterns you can simply just add them into that exercise. Be sure to practice the exercise descending as well. Well that’s all for me today. Sorry, what DVD are you talking about?